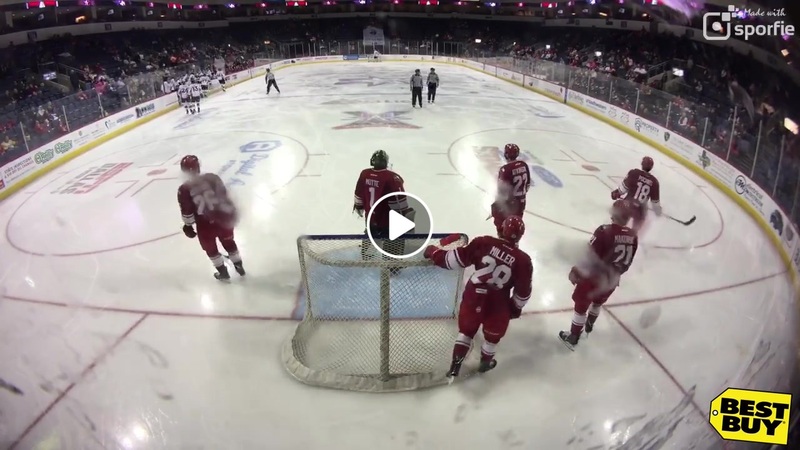 ALLEN, TX – It turned into “fives night” at the Allen Americans game Thursday before a crowd of 3,845 at the Allen Event Center. 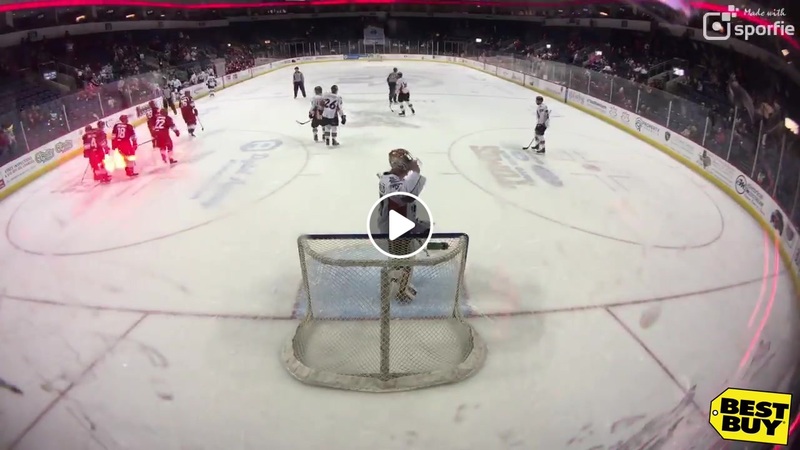 The Americans lost the Mavericks 5-3. It was the fifth-straight win for Kansas City and the fifth-straight loss for Allen. KC scored five straight goals, which was the third time this season Allen has allowed five in a row. – Allen got off to an outstanding start in the game. They scored two goals in 23 seconds (6:58 & 7:21) and at one point had an 11-1 shot advantage. A big momentum shift happened late in the period when it looked like Allen would take a 2-0 lead into the first intermission. A cross-checking penalty led to a Kansas City power-play goal with 50 seconds remaining in the first period to cut the score to 2-1. 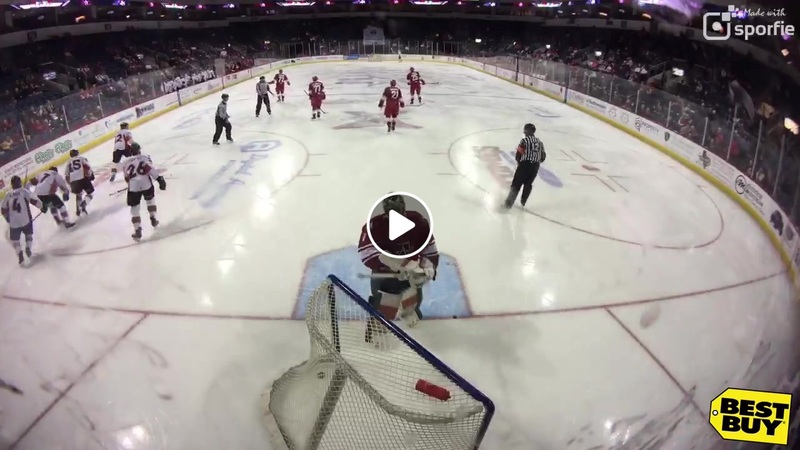 – The Mavericks dominated the second period out-shooting Allen 11-5 and out-scoring the Americans 3-0 to take a 4-2 lead into the second intermission. 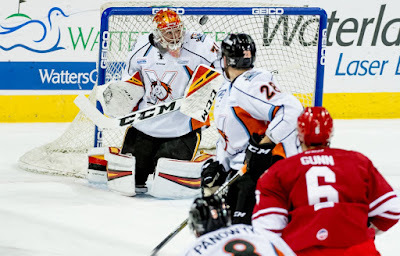 – Allen made a valiant effort in the third period with a 17-12 edge in shots but did not score until after Kansas City had expanded its lead to 5-2 on an empty net goal with just under two minutes remaining in the game. For the second game in a row, Spencer Asuchak scored a late goal, this time with 40 seconds remaining to make the final score 5-3. – If you are a glass half full type of fan, there is plenty to like about the game last night. Allen out-shot its opponent (36-31) for the first time all season. They also scored first, they won the first period 2-1 and had only four penalties in the game. In the past, that performance would be almost a guaranteed victory. – If you are a glass half empty type of fan, you would see yet another blown lead. The Americans out-shot the Mavericks 11-1 to take a 2-0 lead early in the first period, but then gave up five consecutive goals. From the last half of the first period, until the middle of the third, Kansas City out-shot Allen 26-14 and scored four goals. In the last 10 minutes of the third period, Allen dominated with a shot advantage of 11-4, but it was too little too late. 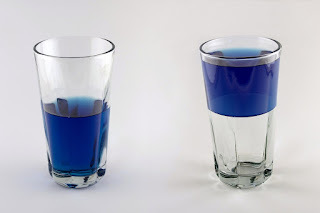 The glass half empty point of view would also point to Allen once again losing the special teams battle going 0-4 on the power play and 2-4 on the penalty kill. 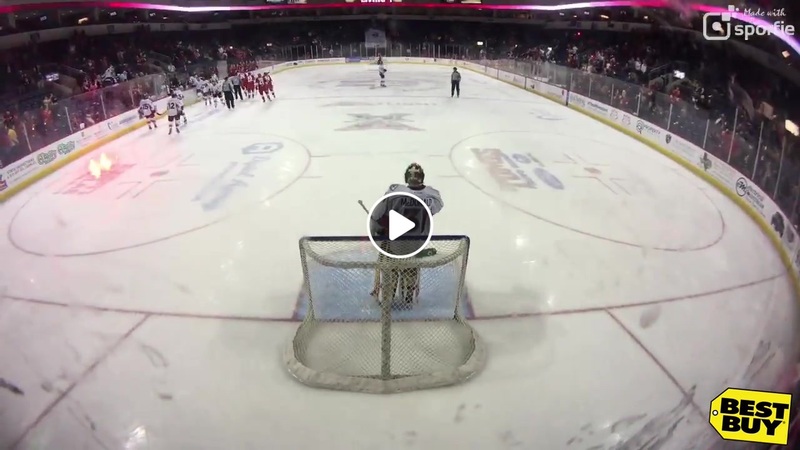 Makowski – The thing to notice on this goal is Makowski’s shot. There was no screening of the goalie; just a well placed rocket of a shot by David. Pochiro – There were two great plays made for this goal. Adam Miller first makes the pass to Pochiro in the high slot, who then puts the puck in the net just inside the post. Asuchak – Spencer gets behind the defensemen and stuffs in a rebound off the stick of Adam Miller. The shot from the point was from Alex Breton. On this goal it looks like the puck never crosses the goal line. I think what bothered Allen fans and coach Martinson was the referee chose not to talk to the goal judge or linesmen to see if their point of view might have helped. 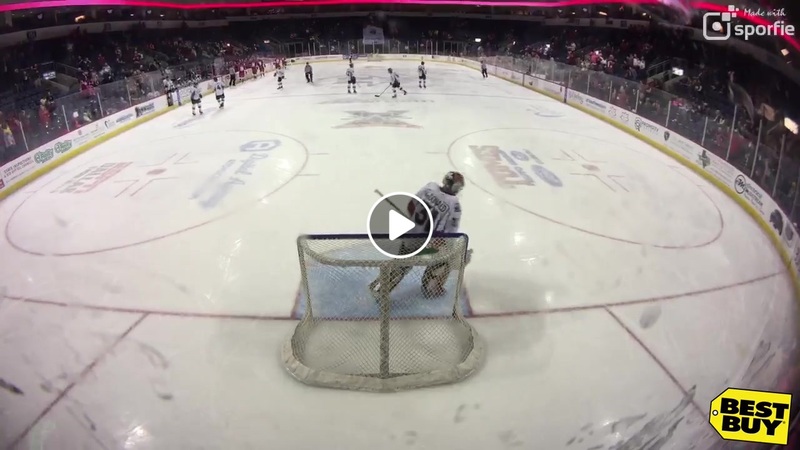 This goal went post-to-post and trickled in the net. It was just a case of bad hockey luck; sometimes the bounces don’t go your way. 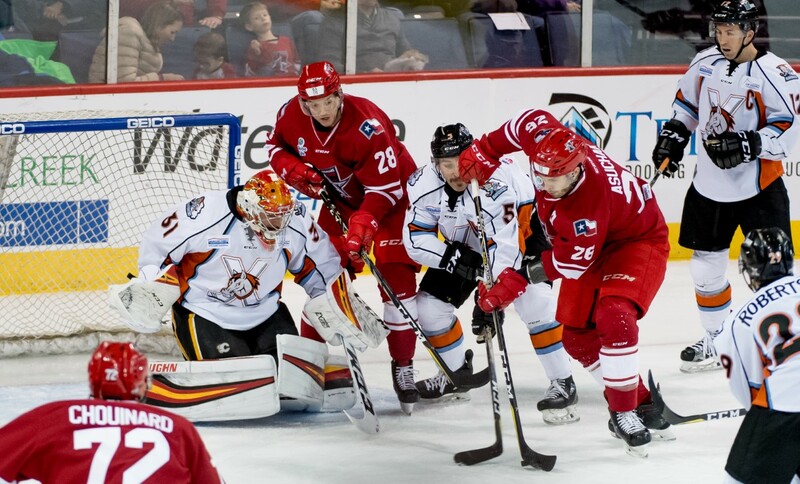 – The Americans will be back in action tonight (7:05 pm) trying to break an overall losing streak (five games), a home losing streak (four games) and a losing streak against Kansas City (three games). It is an understatement to say Allen desperately needs to find a way to claw out a win. – I expect Jeremy Brodeur will get the start in goal. The other lineup change will have newly acquired forward Alex Ranger getting his first start, replacing Johnny McInnis who was injured in the first period (upper body) last night and did not return. – Special teams was the difference-maker last night, as it has been in all three losses to the Mavericks this season. Allen has not scored a power-play goal against Kansas City, going 0-3, 0-3 and 0-4 in three games. The Mavericks were 2-6, 1-5 and 2-4 in the three games. If you add it all up Allen is 0-10 (0.0%) on the power play while Kansas City is 5-15 (33.3%). It is hard to win with a discrepancy like that. – Allen out-shot Kansas City 36-31 which was a big accomplishment given the fact they are last in the league in shots allowed (40.08) while the Mavericks allow an average of 28.00 shots per game. If the Americans can repeat their success in shots and score a power-play goal they should get their first home win tonight. – The officiating crew tonight will be all new. The referee scheduled is Andrea Barone (#13) and the linesmen will be Jordon Solomon (#78) and Aaron Schacht (#31). 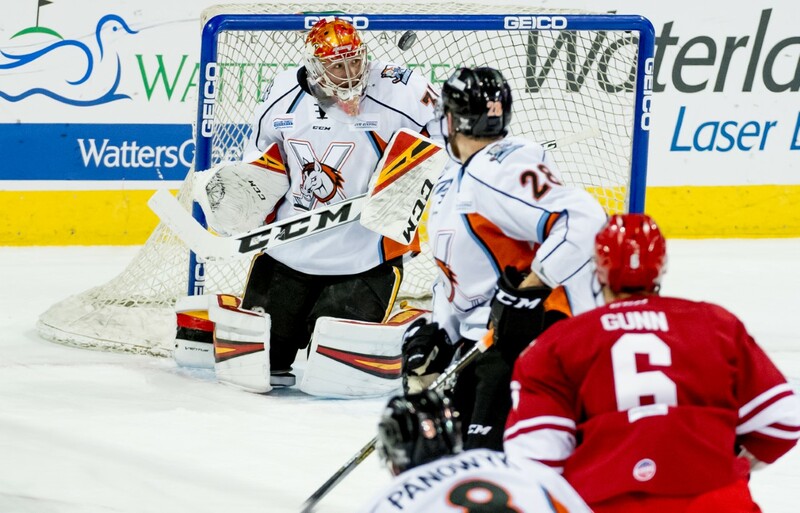 – Allen acquired the rights to Garrett Clarke yesterday from the Indy Fuel. The Americans sent forward Jordy Stallard to Indy in the deal. Clarke is currently playing for ASC Corona Brasov in the Erste Liga, which is a city in the Transylvania region of Romania. Obtaining rights is one thing, but getting Clarke signed and in Allen is a whole other story. This typically is not a quick process, but from what I have observed over the years ,coaches don’t trade for a player’s rights unless they expect to get them signed. Clarke is an agitator supreme who is tough as nails. He is also the Allen Americans all time penalty minutes leader with 432 PIMS. If and when he returns, Garrett will fill a role the Americans have been missing. – Braylon Shmyr was a healthy scratch last night as his team (Springfield) lost to Lehigh Valley 8-1. Springfield plays again tonight in Hershey. As much as you want Braylon to play, play well and stay in Springfield the Americans could sure use his help right now. Allen has lost all four games since Shmyr has been in the AHL and he still leads the Americans in goals and points. 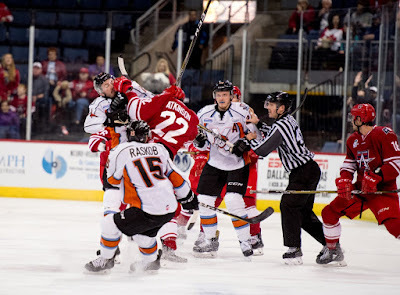 – Allen’s leader in assists is defenseman Alex Breton who has eight. Breton is tied for third among all ECHL defensemen in assists (8) and points (10). – Allen’s five game losing streak is the second-longest since the Americans joined the ECHL in 2014. Last season, Allen had a six-game losing streak. – Here is the specialty jersey the team will wear tonight. They are already being auctioned on LiveSource. As of this morning many of the jerseys did not have bid, all of which start at $240. Maybe now’s a chance to pick up a good-looking jersey for a less than normal price. DID YOU KNOW: Here are the Allen Americans longest losing streaks for each season since they joined the ECHL. If you look at regulation losses, only the 2014-15 championship team lost just two games in a row one time all season. The 2015-16 championship team also never lost more than two regulation games in a row all season but they lost two in a row four times.